If there’s one item of clothing we could pick day after day, we have to say it’ll be denim without an iota of doubt! 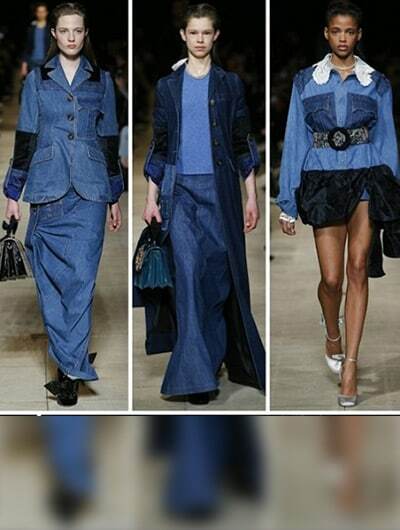 We’re sure you all agree that the spirit of fashion has always been synonymous with denim. Be it jeans, jacket or shirt, its versatility makes it a hands down winner. Dress-down or dress-up, denims are our forever go-to piece. From the streets to the paparazzi laden events, we’ve pulled together looks you just can’t afford to miss. Rock the denim on denim trend in style, get inspired by Rihanna’s look, keep it simple with a denim chambray shirt and a distressed denim skirt. To notch up the look throw on a cap and put on a pair of neutral heels. The Brazilian model and actress pulled of the tricky denim dungaree trend and makes it look like a breeze. To get her look pair a blue denim dungaree with a white peasant top, Ray Bans and thong sandals, to finish the look wear a charm necklace. Keep it cool like the airport queen Jacqueline Fernandez. To rock the distressed denim skirt pair it with a quirky crop top and layer it with a denim jacket. Get inspired by Kim Kardashian’s Uber Chic look. To get her look, throw on a denim dress paired with a pair of gladiator sandals. Miranda keeps it simple by pairing a denim shirt with a pair of shorts. To complete the look add those sunnies and carry a sophisticated handbag to complete the look. This is the perfect outfit for a weekend getaway. Team your denim shorts with just about any breezy top and footwear you’re comfy in. Add a bright colored accent to finish the look. Nobody does athleisure like Anushka, throw on a casual dress and compliment it with a denim jacket and converse sneakers!